Stop the process of tooth decay and bone loss while enjoying a more beautiful smile. Gum Graft Surgery is necessary if you have advanced stages of gum recession and it’s been recommended to protect your teeth from further damage or bone loss. You may also choose to have the surgery for cosmetic reasons, such as to eliminate a “toothy” smile and achieve a more symmetrically even gum line. There are 3 types of Gum Graft Surgery. Dr. Bokser can explain your options and help determine the best approach for enjoying a more beautiful smile today. Gum Graft Surgery (also called Gingival Graft Surgery) is necessary to protect your teeth from gum recession, which is also known as Gingival Recession. Gum recession occurs when the gum tissue surrounding the teeth shrinks back or wears away, exposing more of the tooth, or the tooth’s root. As a result your teeth start to look longer (i.e., a “toothy” smile) and you may experience sensitivity to hot and cold. You may even have pain as more of your tooth and its root become exposed. Eventually, gums can recede so much that tooth roots are almost completely exposed. This robs them of nutrients and leaves them open to attack by bacteria, ultimately leading to decay and removal. Surprisingly, gum recession is fairly common among many Americans. It’s estimated that 5-10% of adults are afflicted with this problem, which can often go unnoticed until it becomes severe. During Gum Graft Surgery, Dr. Bokser addresses the problem by taking tissue from the roof of your mouth and attaching it to remaining gum tissue to cover the exposed root. This can be done for one tooth or several teeth and will result in a more even gum line. The procedure will also reduced sensitivity as well as help prevent further loss of gum tissue. 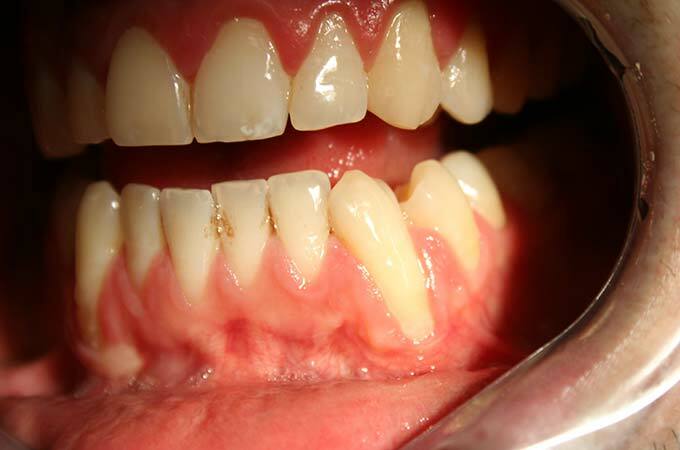 Aggressive brushing can traumatize the tissue and lead to permanent damage. Periodontal disease, also known as gum disease, is a bacterial infection that can destroy the connective fibers and create pockets between the gums and the teeth. Smoking or any kind of tobacco use has devastating effects on the entire oral cavity. Chewing tobacco in particular, aggravates the gingival lining of the mouth and causes gum recession if used continuously. Poor oral hygiene, such as poorly performed or neglected brushing and flossing, can result in a plaque build up and begin to affect the teeth. The plaque contains various bacterial toxins which can promote infection. Tongue and lip piercings which can rub and irritate the gums, wearing the gum tissue away. Diabetes that is not well managed can negatively affect gum health. Genetics, especially if your parents had chronic gum recession from gum disease or misalignment, may be predisposed you to developing similar condition. What are the types of Gum Graft Surgery? Dr. Bokser offers three different types of gum tissue grafts. 1. Connective-tissue grafts: During this most common grafting procedure, the tissue is taken from the flap of skin at your palate (the roof of your mouth) and then stitched over the area of exposed root. 2. Free gingival grafts: This is similar to connective tissue grafts described above, although the tissue is taken directly from your palate (the roof of your mouth). This method is generally used to thicken naturally thin gums. 3. Pedicle grafts: In this procedure, instead of using tissue from the roof of your mouth, a pedicle graft uses a flap of tissue from the gum of a tooth next to the one with recession. The flap is partially cut away, with one edge still attached. This flap is called a pedicle. It is then slid sideways to cover the exposed root and stitched into place. Gum grafting is a common periodontal procedure, and can generally improve function as well as the esthetics of your smile. 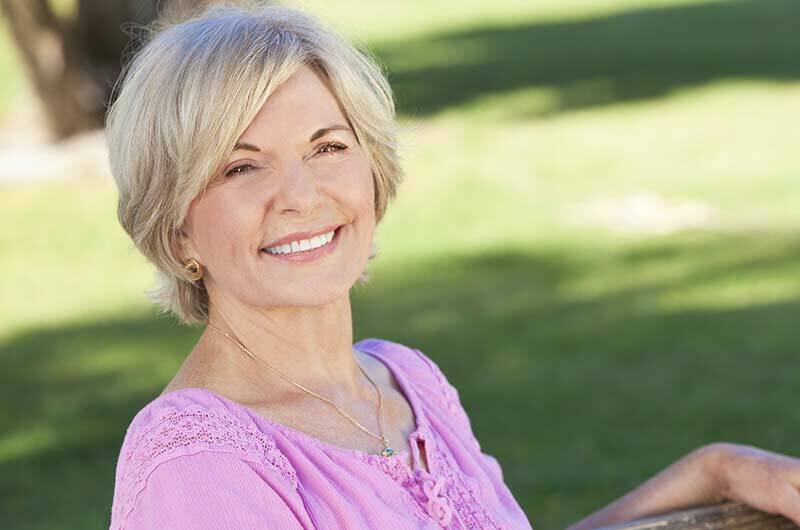 Gum Graft Surgery can help stop the process of gum recession and bone loss, preventing further problems and protecting exposed roots from further decay. Gum grafts can help reduce tooth sensitivity, especially to hot and cold foods. When the tooth root becomes exposed, eating or drinking hot or cold foods can cause extreme sensitivity to the teeth. Gum grafting surgery permanently covers the exposed root, helps reduce discomfort, and restores the good health of the gums. Gum grafts can result in a more even gum line, making your smile more symmetrical and making the overall appearance more aesthetically pleasing to look at. Who typically gets Gum Graft Surgery? Gum Graft Surgery is necessary if you have advanced stages of gum recession and it’s been recommended to protect your teeth from further damage or bone loss. You may also choose to have the surgery for cosmetic reasons, i.e., to improve the appearance of your smile. If you have any questions about Gum Graft Surgery or if you’d like to schedule time to review your options, contact Dr. Bokser today to schedule an appointment.